Design: Nenad Dogan Printed by: AGM, Zagreb 1993. The guide book to Sarajevo was written in Sarajevo between April of 1992 and April of 1993 during the Sarajevo siege. 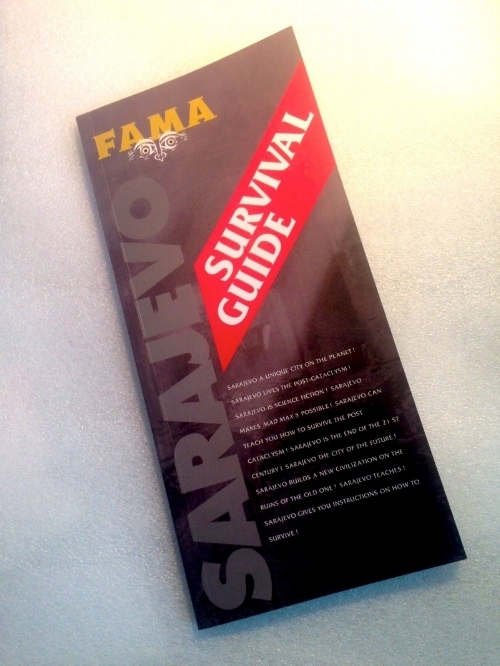 During the war, in a besieged town, under the fire of shells and snipers, in conditions impossible for life and work, the Guide Book to Sarajevo was created. It intended to be a version of Michelin, taking visitors through the city and instructing them on how to survive without transportation, hotels, taxis, telephones, food, shops, heating, water, information, electricity. It is a chronicle of survival, a part of a future archive which shows the city of Sarajevo not as a victim, but as a place of experiment where wit can still achieve victory over terror. This book was written at the site on which one civilization was dismantled in the course of intentional violence, and where another one had to be born. That one, which makes something from nothing, gives some messages for the future. Not because the future is necessarily a future in war, but because humans are growing older and being born into a world which is ever less secure. The book's style is dry and simple. Its sentences are propagandistic yet jovial, short and succinct. Its 'recipes' of all kinds should be followed precisely, because survival is dependent on their content. The text is accompanied by photographs which depict all life and death situations -- fromdevastation to the funerals, from Sarajevo citizens to their way of life. Sympathy, empathy, anguish, moral indignation: It's easy to feel all these for the faraway victims of a long-running foreign tragedy, like Sarajevo's, that comes to you basically through the news. Things go to another level entirely when those victims start making jokes with references you can actually laugh at. Hence the shock when the latest printed document out of Sarajevo, breaking the endless flow of atrocity narratives, is a macabre spoof whose target is immediately obvious to anyone who has passed through that large, mainly under-40 American category, the budget traveler. In the slim black volume called "Sarajevo: Survival Guide," a dead-on parody of a hip travel guide series, the jokes are, to say the least, chilling. But more chilling than the jokes themselves is the realization of the common cultural ground they attest to between the reader -- whether American or British, German, Australian -- and the apparently young Sarajevans who wrote it. These aren't distant, brutal, "primitive" Balkanites swayed by passions we can't influence or understand. They're people who share with the reader a savvy, savagely funny cultural vocabulary and an exhaustive familiarity with the great leisure literary form of the last decade: the budget adventure travel guide. "Sarajevo: Survival Guide," a mock guidebook to the war-flattened city, sends up those self-consciously "rough" shoestring guides to Africa, Asia and the Middle East, dubbed "travel survival kits" by their British publisher, Lonely Planet, and the many imitations they have spawned. These guidebooks, which broke into prominence in the mid-1980s, are beloved of adventurous middle-class wanderers for the same reason people buy clothes at Banana Republic: They mark you as no silly tourist but a traveler. The word "survival" in this context was always somewhat self-indulgent. Now it burns. The Sarajevo parody, bits of which were excerpted over the summer in this newspaper and in Harper's Magazine, is now finished and in book form. The copy I saw came with a returning human rights observer from Zagreb. More copies, and ideally some plan for selling them, are supposed to arrive early next year along with a Zagreb-based representative of the group responsible -- a Sarajevo cultural organization, of all things, which has the acronym FAMA and tries, on dribbles of foundation money, to preserve something resembling multiethnic civilized life as the city falls. The "survival guide" offers fake tips for the traveler: where to make (or attempt) long-distance calls, where to get a haircut, where to go on weekend excursions ("the best journalists' routes lead to the front lines") and how to find a cafe. If the vocabulary and attitude are Lonely Planet, the format is conservative Michelin. There are entries for Theaters ("Sometimes there are cocktail parties where the humanitarian aid is served"); Cinema ("Once a week at 1 p.m. The place is safe"); Going Out of Town ("Officially, there is no such thing as going out of town"), Recreation (running and "urban rock-climbing" between balconies in case of fire); bus, taxi and postal services (none) and lots of no-ingredient recipes. Along with the mock guidebook are mock postcards, high-quality glossy images (of ruins and horrors, of course) that for some reason give an even worse wrench. Those who've been trained not to joke about other people's tragedies tend to find themselves at a momentary loss when the victims joke about their own. For one thing, it stifles condescension. This, FAMA makes clear in brief introductory copy, is part of its intention: "It is a chronicle, a guide for survival, a part of a future archive which shows the city of Sarajevo not as a victim, but as a place of experiment where wit can still achieve victory over terror. ... " A somber back-jacket quotation, breaking out of the tongue-in-cheek mode, observes that the book is "the first guide-book of death in the recent history, the guide-book that puts an end to our lighthearted wanderings across the globe. It should definitely change our geographical perspective and our travel morality." Lest this seem to hope for too much, it's worth noting how the travel joke keys into a particular phenomenon, a "travel morality," if you will, widely shared by the hordes of travel enthusiasts who came of age when the world beyond the old Grand Tour was becoming suddenly and cheaply accessible. For such travelers, don't-drink-the-water tourism has always had a strong unspoken connection to the notion that the world and one's mind were open: that the First World luck and luxury one was born in didn't, needn't, lock off all possibility of genuine contact, that with a little openheartedness one could still move through very different spaces, sleep cheerfully in very different conditions, hear very different ideas. Probably travelers have always felt this; never before, though, could so many get on planes and into International Student Youth Hostels at such low cost and step out of them into worlds that seemed -- surely! -- amenable to intercultural understanding by those who paid attention and fundamentally meant well. This group of post-baby-boom travelers, in which I number myself, is just the age to be learning, from the unfolding Bosnia genocide, a very different lesson about the world's susceptibility to sincerity and logic. The jokers in Sarajevo seem somehow to know all about us and our fading illusions (in the old days, after all, tantalizingly alien Sarajevo received many such travelers) and, dodging shrapnel and despairing of aid, they laugh them to scorn. The sting of their wit makes them more real -- it's still worth pausing to be ashamed by this -- than reports of their suffering ever could.